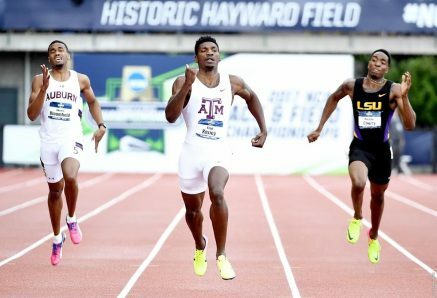 13th June 2017 – After winning the 400m and 4x400m titles at the NCAA Outdoor Championships in Eugene last weekend Texas A&M star Fred Kerley today announced that he will be represented by Ricky Simms of PACE Sports Management for his professional career. Fred created headlines last month when he broke the 25 year old NCAA 400m Record at the NCAA West meet in Austin with a time of 43.70 seconds, making him the fastest runner in the world in 2017 and the seventh fastest 400m runner in history. Earlier in the year he won NCAA Indoor titles at 400m and 4x400m improving his indoor personal best to 44.85 seconds, the 4th fastest in history. “I have been honored to wear the Texas A&M uniform for the past two years. It has been a great learning tool for life. I would like to thank Coach Henry and Coach Francique and all the staff for helping me on this journey. I am excited to take the next step in my career and run on the professional circuit. The mission continues”, said Fred from his base in College Station. “Fred had a phenomenal year so far in 2017 and has an extremely bright future. I have heard great things about Fred as athlete and as a person and we look forward to guiding him on his journey as a professional athlete. He has the potential to be one of the stars in the sport of athletics in the next few years”, commented PACE CEO Ricky Simms. PACE Sports Management is a world leading sports management and marketing company representing some of the biggest stars in the sport including the world’s fastest man Usain Bolt, the world’s greatest long distance runner Mo Farah, Olympic and five times World Champion Vivian Cheruiyot, Olympic & World Indoor 1500m Champion Matthew Centrowitz as well as a host of World & Olympic medalists. For further information see http://www.pacesportsmanagment.com.